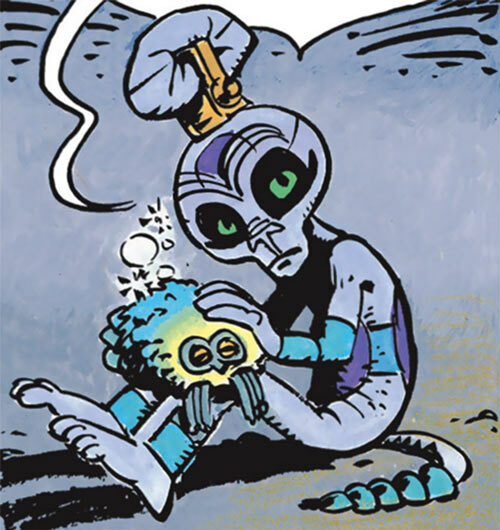 Schniarfers are an alien species in the Valerian, Space-Time Agent graphic novels. 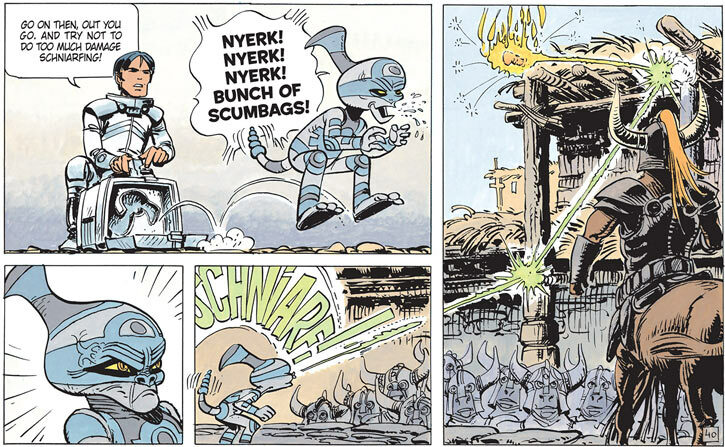 A Schniarfer first appears in 1990, in the The Living Weapons graphic novel. Schniarfers — so named because they can schniarf — come from the dismal, extremely dangerous planet Bromn. They are homonculi with Human-like hands and a rattlesnake-like tail. As an evolutionary adaptation, their shabunal gland release a compound in their bloodstream. It makes them nasty, aggressive, and taking pleasure in schniarfing. This constant hostility is necessary to defend themselves on Bromn. As a side effect, a person who seize them by the shabunal gland will imprint onto the Schniarfer, who will become forced to serve them. This may be because squeezing the gland provokes an overdose of shabu. Thus, Schniarfers are prized as faithful living weapons who will schniarf on command. In a few cases, Schniarfers were equipped with a circlet around their shabunal gland. It normally compresses it so the Schniarfer isn’t constantly in the throes of rage. But a switch can release the pressure, making the Schniarfer aggressive again – and restoring his full ability to schniarf. Most space-going people will recognise a schniarfer and the risk it poses. Shabunal gland binding seems much more obscure. Thus, a gland-bound schniarfer could go past security who did not realise that this was reversible. However, one strongly suspects that corruption was also involved in this case. Valérian was once hired by penny-ante weapons merchant to deliver a Schniarfer to obscure, war-torn, low-tech planet Blopik. This specimen was as nasty, crude and aggressive as any Schniarfer. Even though Valérian had squeezed its shabunal gland, the alien was insulting and difficult to control. 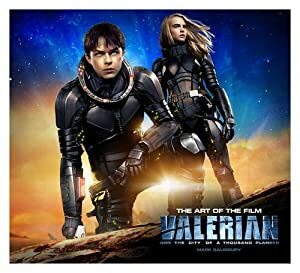 Laureline was angry that Valérian was trafficking weapons to pay for ship maintenance. The job was generally miserable. Valérian eventually decided to leave Blopik behind, and take away all the living weapons recently brought planetside. He then operated on the Schniarfer to keep his shabunal gland bound – a minor, reversible surgery. Valérian most likely wasn’t the first person to do that operation, but he had to independently develop the procedure. Still, it was a complete success. The Schniarfer was highly appreciative of no longer being in a state of constant aggression. Articulate and friendly, he joined a troupe of alien artists and Laureline to perform in a circus show in major Russian cities. Apparently, he performed as a sort of carnival trick shooter. The show was a success. A different Schniarfer was later acquired by the Quatuor Mortis. This Schniarfer was an ex-con. A previous owner had been another criminal, who had used the Schniarfer in a failed attempt to break into a major embassy to steal stuff. The QM equipped the Schniarfer with a reversible shabunal gland circlet. 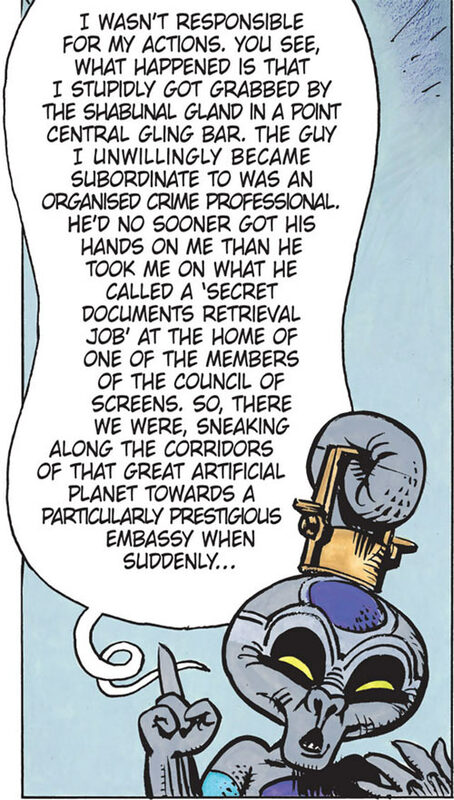 Then they smuggled him into a megaluxury cruise ship to kidnap a VIP. They unlocked the circlet to let the Schniarfer cow and intimidate a roomful of tourists. When the security came in, the schniarfer destroyed half a double detective with a single schniarf. However, Valérian pounced on the schniarfer and bound its gland again. This made the Schniarfer Valérian’s ally, and the Human took it along. The Schniarfer proved an invaluable ally in rescuing Laureline, who had been accidentally kidnapped by the Quatuor. 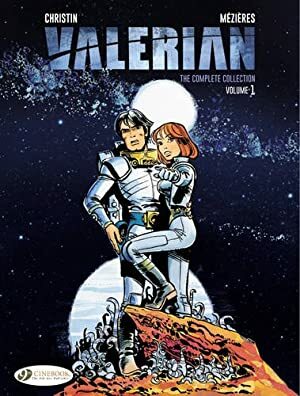 He then stuck around by Valérian and Laureline, becoming a sort of sidekick. Laureline and Valérian later handed their Schniarfer over to their friend Ky-Gaï, to serve as a bodyguard and help her run her business. The Schniarfer apparently did a fantastic job at revitalising the industry in which Ky-Gaï used to work. His business acumen also improved the previously dismal conditions of the garment workers of Phnom-Nam. When Ky-Gaï went on a successful quest to find the Time-Opener, she took her Schniarfer along for security. The Schniarfer wanted to focus on running the company instead, but had to come along. 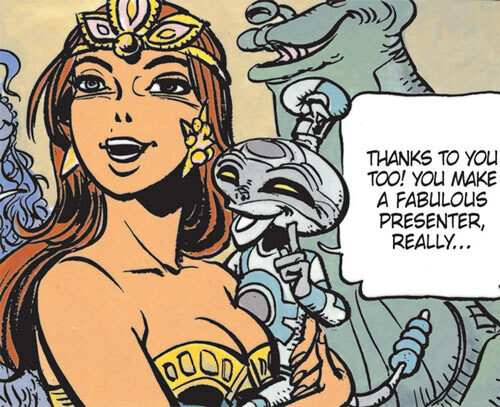 When she was reunited with Laureline and Valérian, Ky-Gaï had the Schniarfer help her fellow Humans. Later on the pair helped with the logistics with the nanotech injection for the fighting force raised against the Wolochs. 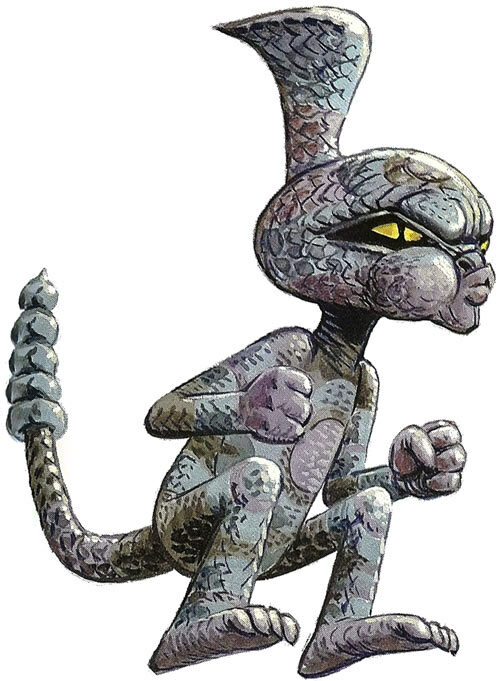 During the battle against the Order of the Stones, the devastating Schniarfer was snatched by the willy Earth criminal Sun Rae, who imprinted on him. With Sun Rae’s talent for underworld enterprises and the many opportunities that brought to schniarf, the Schniarfer was satisfied by his new boss. The pair then associated with “irregular explorer” Captain Singh’a Roog’a as the tough-as-nails space picaroon was assembling her newest motley crew. A solid projectile, which the Schniarfer can accurately ricochet off multiple surfaces. The apparent weight of the projectile also seems modifiable to alter its trajectory. A corrosive that can melt through thick, hard metal. It can also dissolve a man. A sort of energy attack, perhaps not unlike lightning. This can be less-than-lethal, or lethal. Schniarfers also have a keen sense of smell. It is precise enough to track targets and hit them with schniarf. However, it makes them sensitive to bad smells. Schniarfers can schniarf with amazing accuracy. Even if the shot involves multiple ricochets. Or hitting multiple targets with shrapnel from a single schniarf impact. This is a good part of what makes them so dreaded – they don’t miss. Also, they’re rather quick. Thus, people who know that a Schniarfer is aiming at them will act as if threatened by a tripod-mounted machinegun. Schniarfers in an aggressive mood have an horrible voice. Apparently it’s less insufferable once their gland has been bound. Under the influence of shabu, Schniarfers are cruel, hyperactive ravagers who draw great physical satisfaction from schniarfing. They love terrorising others, and are liable to play with their prey. They constantly swear, shout abuse… and schniarf. Once the gland is bound, there’s an adjustment period as the Shniarfer will be overwhelmed with affection toward their new master. It will gradually subside, but the Schniarfer will remain highly loyal, helpful and supportive. If a Schniarfer is ordered to turn against their old master by their new master, the new imprinting may not work as the old imprinting is still present. Once a gland has been bound, Schniarfers become very talkative – or at least the two observed specimens were. They are deprived from most social interaction when in a rage, so they make up for the lost time once they’ve been made calm. The second Schniarfer often launched into comical walls of text, loved lecturing about his interests, and made a constant lot of unrequited comments and remarks. He really liked the sound of his own voice – which lost its horribleness as shabu levels receded. In particular, he spent all his time reading about business management and would often launch into MBA tirades. However, he was also genuinely helpful, and even helped take care of animals. He also seemed quite smart, and was a highly competent entrepreneur. A Schniarfer with a bound gland still will long to schniarf from time to time. It is better for them to have occasions to release their destructive, schniarfing wrath. Shrinking is Always On and Already Factored in. A Schniarfer’s movement speed is minus 2 but their OV vs ranged attacks is 06. The various attack Powers are all Contingent Upon Projectile weapons, as they all represent schniarfing. Only Projectile Weapons has a Range, but the other Powers can ride Projectile weapons’ Range. The various attack Powers all have the Indirect (+1) Bonus. They do not have to follow a straight line, but they need something to ricochet on or shrapnel from. The various attack Powers have a selective 0-APs Area of Effect. Analytical smell/tracking scent allows for attacking without penalties targets that are unseen but clearly smellable. Accuracy (Shniarfing): 07. The second Schniarfer had Charisma (Persuasion): 04. The second Schniarfer had a Scholar in Business Administration. Creepy Appearance (Theirs is an unpopular, feared species), SIA toward serving the person who last squeezed their shabunal gland, MID of people/species with an unpleasant smell, Misc. : with the shabunal gland active, Schniarfers have an altered personality. Under the influence of shabu, a Schniarfer has a Serious Rage, a Psychopath Motivation, and the Iron Nerves and Lightning Reflexes Advantages. An AV of 07 is enormous for the setting, where AVs above 04 are heroic and OVs are on the same scale. To most onlookers, it will look like a Schniarfer never misses. But they’re not more accurate than an AV of 07 anywhere else. Notably, a Schniarfer once missed Valérian, though Valérian was in flight and spent Hero Points. And the Schniarfer may have been going for a Trick Shot to make roll fall onto Valérian rather than hit him directly. The EV is also superior to energy small arms in common use in the setting. There are of course pistols and carbines with a higher EV. But that usually means Terran military hardware like the one Valérian uses during the rare, genuine combat mission. Writeup completed on the 15th of May, 2017.